The couple will be going to the Santa Barbara Polo & Racquet Club where the prince and princess on Saturday and watch Prince William lead his fellow polo players into competition and then see Kate present the trophy to the winning team. The itinerary calls for causes backed by the couple and others in the royal family, including environmentalism, welfare for families of disadvantaged children, and support for military personnel. 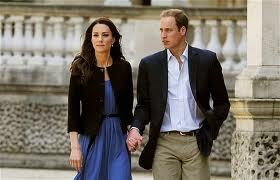 The prince and princess do hope to exchange pleasantries with a few people between stops on their tour. Hundreds plan to gather at Ye Olde King’s Head, a popular British restaurant and pub in Santa Monica, to celebrate. The couple’s friend, David Beckham, does drop in from time to time at the pub, where a traditional royal tea is planned Saturday afternoon. The royals will be welcomed to California on Friday by Gov. Jerry Brown and other dignitaries then meet with venture capitalists, industry leaders and philanthropists. The charity fundraising match may provide the couple’s best opportunity for sightseeing and celebrity stargazing, depending on how much of it William can do from the back of a galloping horse. Nick Booth, who runs the charitable Foundation of Prince William and Harry, said William and Kate, formally known as the Duke and Duchess of Cambridge, haven’t invited any celebrity guests to the club, located along a stunning stretch of coastline and mountains, but they won’t object if any show up. For those who can’t afford $4,000 to rub elbows with the royal couple, a $400 ticket will buy admission to the grandstand, a box lunch and a souvenir program. Sponsors expect both tickets to sell out, raising millions for charity.